I know I join all of you in continued prayer and concern for our brothers and sisters in the Philippines who are suffering so greatly in the wake of the devastation wrought by Typhoon Haiyan. While it is encouraging to see that in recent days some measure of assistance and supplies have begun to arrive in the affected area, this is just the beginning of a relief and rebuilding effort that will continue for months and years to come. I have asked that a special collection be taken up in the parishes of the Archdiocese of Boston at Masses on Nov. 16-17 that will be directed to Catholic Relief Services to aid in this important work. Those of you not within the Archdiocese, or those who wish to give to CRS immediately, may do so here. 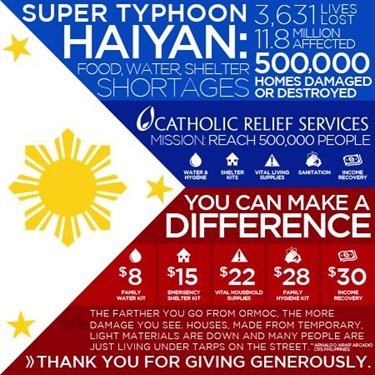 I urge all of you to prayerfully consider what amount you may be able to give to help those who have lost so much. 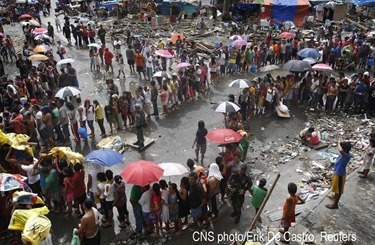 In this time of crisis we turn to our Lord Jesus Christ, who has promised to be with us always, in prayer for the repose of those who perished in the storm and for the strength to bring the needed healing to the injured and to assist the Philippines in recovering from this natural disaster. Together we will go forward with our Filipino brethren as they carry out their mission in the Church and the world. 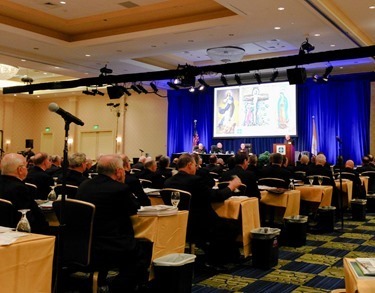 I spent much of my week at the annual fall meeting of the U.S. Conference of Catholic Bishops. However, before I left, we had one of our regular meetings of the Archdiocesan Pastoral Council, which is a body that advises me very much like a local parish council advises a pastor. At the meeting, we dedicated a lot of the time to looking at the questions that the Holy See has been circulating regarding the theme for next year’s Extraordinary Synod on marriage and the family. I was delighted to see how happy the members of the Council were to be able to make those contributions. We will also be sending these questions out to the parish councils and staff’s to look at as well. Also during the meeting, we heard from three representatives of parishes that are taking part in the first phase of our pastoral planning initiative, Disciples in Mission. We heard from Father Brian Flynn, pastor of St. Mary’s and Sacred Heart Parishes in Lynn; Casey Grant representing St. Joseph’s and St. Luke’s in Belmont and Mike McShane representing St. Mary’s, St. John’s and St. Margaret’s in Beverly. While every period of change also comes with its challenges, particularly at first, they said that there is great hope and energy being generated in the parishes and they are beginning to see many positive benefits from parish collaboration. We were all pleased that they are so enthusiastic about the pastoral planning process and I see it as a very positive and hopeful sign as we move forward with our Pastoral Plan. 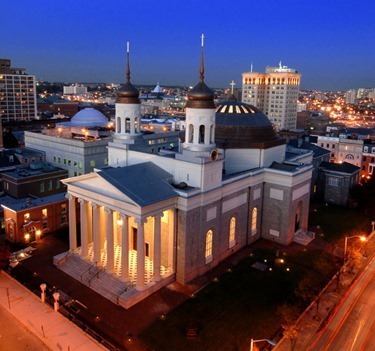 On Saturday, I departed for Baltimore, where the U.S. Bishop’s annual fall meeting is held. Over the weekend, I participated in committee meetings for the administrative board, the Pro-Life Committee and the Subcommittee on the Church in Africa. 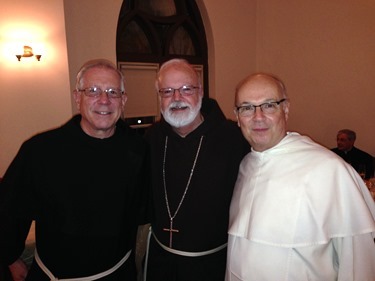 Then, Sunday night, I attended the celebration at the Dominican house of studies in honor of Father Romanus Cessario, a distinguished member of the St. John’s Seminary faculty who was receiving the degree of Master of Sacred Theology from the order. 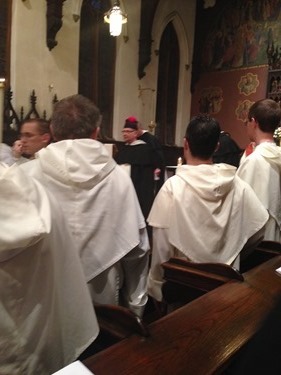 A number of priests and people from St. John’s seminary were also present to accompany him during that celebration. Though the name may make it seem like a typical academic degree, it is not. Rather, it is a rank of honor conferred upon a Dominican scholar who, over his lifetime, has made a significant contribution to the field of theological studies. In that sense, it is something like a lifetime achievement award. The ceremony at which the degree is conferred is quite interesting. First, the conferees receive a ring as a symbol that God has given them Wisdom as their spouse. 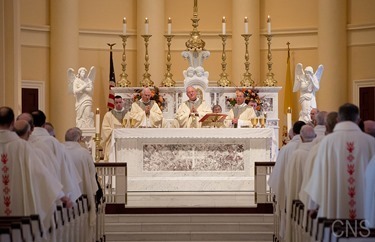 Next, they are seated in a special chair, or cathedra, as a sign that they have been given a special place among the order and asking that the Lord may also give them a “throne of glory.” Finally, they receive a biretta, similar to that worn by bishops, as a sign of their new distinction and asking that the Lord may also give them a “crown of glory”. I know I join everyone in the archdiocese, particularly those at St. John’s Seminary and the hundreds of priests he has instructed over the years, in congratulating Father Romanus on receiving this great honor. 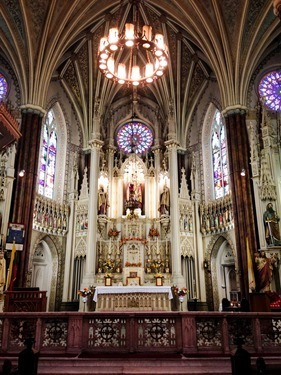 We began our gathering Monday with a Mass at the Basilica of the National Shrine of the Assumption of the Blessed Virgin Mary, the co-cathedral of the archdiocese of Baltimore, which was built by the United States’ first bishop, John Carroll. 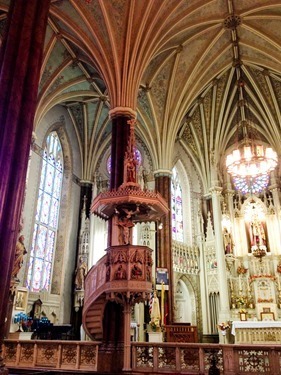 It is a very beautiful and historic church and, since its renovation a few years ago, it is just stunning. 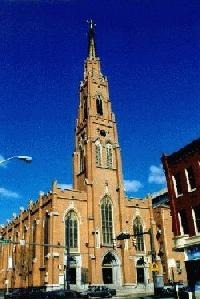 Baltimore is also the home of the impressive church, St. Alphonsus, which is located on Saratoga Street. For much of its early history it was run by the Redemptorists. 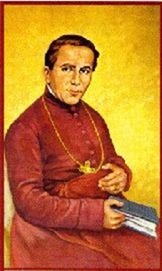 Saint John Neumann was pastor there from 1851 to 1852. 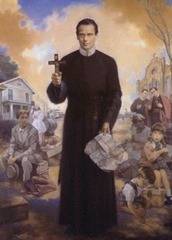 Also, Blessed Francis Xavier Seelos was pastor from 1854 to 1857. I know many people think their pastor is a Saint, but here they could say it and really mean it! Later that day, the plenary sessions of the fall meeting began. Among the many items on our agenda was an address by Cardinal Timothy Dolan on the topic of religious liberty, particularly the persecution of Christians and other people of faith throughout the world. 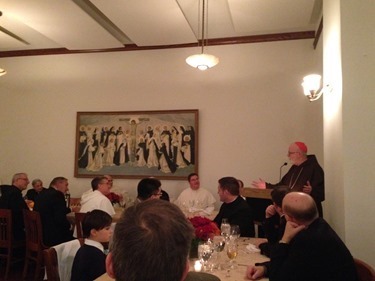 We also heard from the Apostolic Nuncio, Archbishop Carlo Maria Viganò, communicating some of the thoughts and themes that are dear to the heart of Pope Francis on the topic of the pastoral charity of the bishops. There was also time spent at the conference on the situation in the Philippines and how the Catholics of the United States might assist them, both through prayer and monetary contributions, in relief and rebuilding efforts. 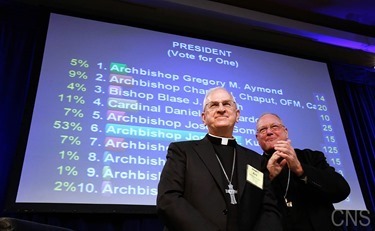 Perhaps one of the most widely anticipated actions we took during our meeting was the election of our new president, Archbishop Joseph Kurtz of Louisville, Kentucky who will succeed Cardinal Dolan in that position. 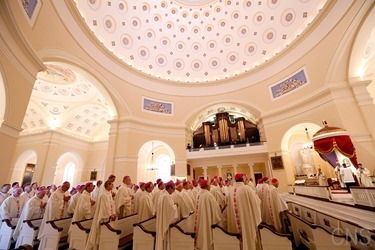 I would like to take this opportunity to express my gratitude to Cardinal Dolan for the outstanding leadership that he has given to the Conference over the last three years, and for his graciousness, good humor and desire to keep the Church unified in the face of the many challenges we face in today’s world. 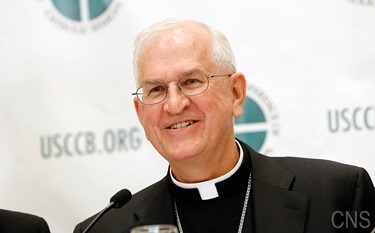 I also want to express my congratulations and best wishes for Archbishop Kurtz as he begins his tenure as president. 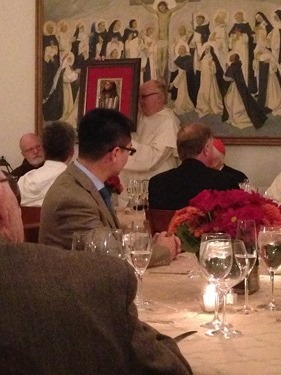 Archbishop Kurtz is truly an extraordinary human being, priest and bishop. He is a man of deep compassion, who comes out of the Church’s tradition of service to the poor and underprivileged. We are very grateful for his generosity in accepting the responsibility of becoming our new president. We stand together as pastors charged with proclaiming the Gospel in its entirety. That Gospel calls us to feed the poor, heal the sick, and educate the young, and in so doing witness to our faith in its fullness. Our great ministries of service and our clergy, religious sisters and brothers, and lay faithful, especially those involved in Church apostolates, strive to answer this call every day, and the Constitution and the law protect our freedom to do so. Yet with its coercive HHS mandate, the government is refusing to uphold its obligation to respect the rights of religious believers. Beginning in March 2012, in United for Religious Freedom, we identified three basic problems with the HHS mandate: it establishes a false architecture of religious liberty that excludes our ministries and so reduces freedom of religion to freedom of worship; it compels our ministries to participate in providing employees with abortifacient drugs and devices, sterilization, and contraception, which violates our deeply-held beliefs; and it compels our faithful people in business to act against our teachings, failing to provide them any exemption at all. Despite our repeated efforts to work and dialogue toward a solution, those problems remain. Not only does the mandate undermine our ministries’ ability to witness to our faith, which is their core mission, but the penalties it imposes also lay a great burden on those ministries, threatening their very ability to survive and to serve the many who rely on their care. The current impasse is all the more frustrating because the Catholic Church has long been a leading provider of, and advocate for, accessible, life-affirming health care. We would have preferred to spend these recent past years working toward this shared goal instead of resisting this intrusion into our religious liberty. We have been forced to devote time and resources to a conflict we did not start nor seek. 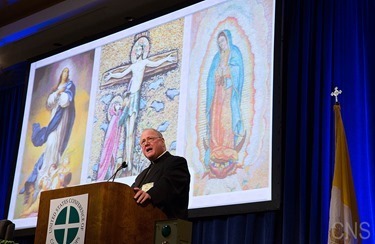 As the government’s implementation of the mandate against us approaches, we bishops stand united in our resolve to resist this heavy burden and protect our religious freedom. Even as each bishop struggles to address the mandate, together we are striving to develop alternate avenues of response to this difficult situation. We seek to answer the Gospel call to serve our neighbors, meet our obligation to provide our people with just health insurance, protect our religious freedom, and not be coerced to violate our consciences. We remain grateful for the unity we share in this endeavor with Americans of all other faiths, and even with those of no faith at all. It is our hope that our ministries and lay faithful will be able to continue providing insurance in a manner consistent with the faith of our Church. We will continue our efforts in Congress and especially with the promising initiatives in the courts to protect the religious freedom that ensures our ability to fulfill the Gospel by serving the common good. This resolve is particularly providential on this feast of the patroness of immigrants, St. Frances Xavier Cabrini. She was a brave woman who brought the full vigor of her deep religious faith to the service of the sick, the poor, children, the elderly, and the immigrant. We count on her intercession, as united we obey the command of Jesus to serve the least of our brothers and sisters.